The market for software that emulates guitar amplifiers is pretty crowded these days, but Native Instruments have found a new angle with a modular program that comes with a dedicated hardware controller and interface. Available for both Mac and PC, Guitar Rig takes the now-familiar concept of amplifier and effect modelling and delivers it in the form of a hybrid hardware/software package, where the hardware acts as preamp/impedance matcher and floor controller, while the software provides the necessary modelling and graphical user interface. PC users will need at least a 700MHz Pentium or a 1.33GHz Athlon XP machine to run Guitar Rig under Windows XP, while Mac users can run it under OS 9 or OS X on anything faster than a G3 800MHz machine. 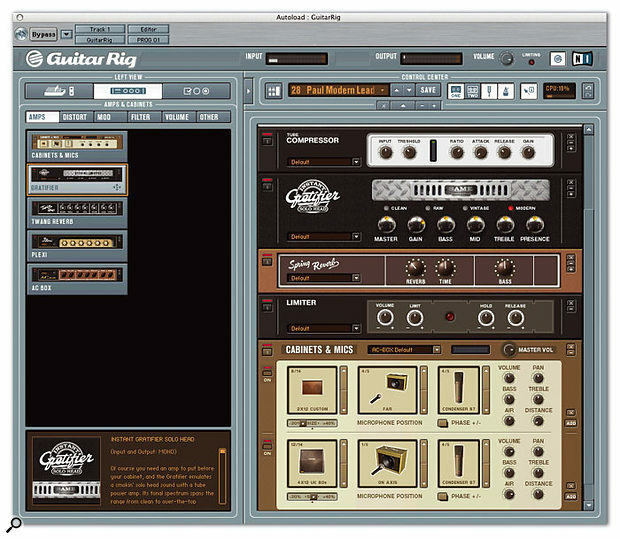 Guitar Rig can run as a stand-alone application, which conjures up visions of a tatooed biker metal guitarist with an iBook perched on top of his stack, or it can work as a plug-in within host software that supports DXi, VST 2.0, AU or RTAS. Authorisation is via a challenge and response code handled by the NI web site or by mail, and the software will run for 30 days prior to authorisation. When used as a plug-in, Guitar Rig is inserted into the signal path as an effect, not as a software instrument, and obviously you need to adjust your audio driver settings for minimum latency in order to be able to play guitar parts comfortably. Though Guitar Rig will work with MME drivers, it is not recommended due to the high latencies these introduce. ASIO or Core Audio are much safer bets. 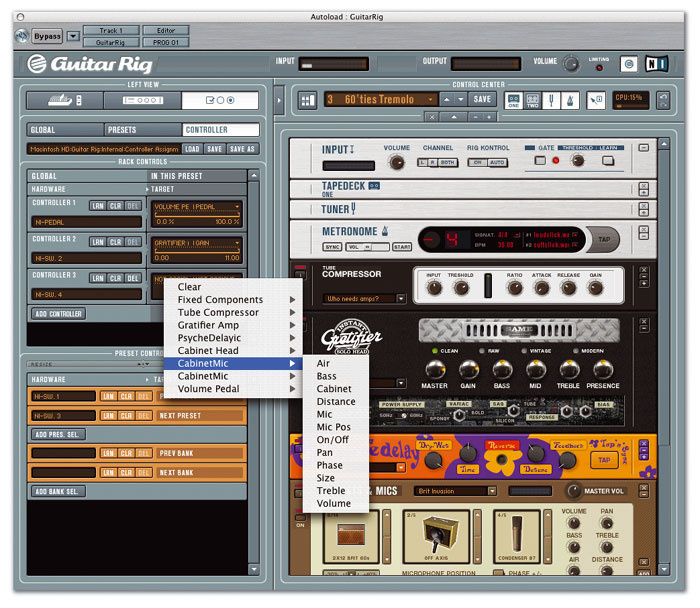 The software amp modelling element of Guitar Rig is similar to many existing products except that the designers have tried to make it more user-friendly by using a drag-and-drop virtual rack interface that looks not unlike a guitar player's version of Reason. Essentially you pick the amps, speaker cabinets and effects you want to use and then drop them into the rack, where the signal always flows from the top unit to the bottom. Those who like to create stereo effects will find split modules for parallel signal routing and there are also two virtual tape decks, one optimised for playing audio that you might want to play along to, such as backing tracks, while the second allows you to record your playing and also to overdub additional parts. The rack includes a very accurate guitar tuner and a metronome that can lock to MIDI Clock or the host sequencer tempo. As of version 1.1, four amp modules are available: Instant Gratifier, Plexi, Twang Reverb and AC Box. As you might imagine, the processing modules include emulations of classic and modern amplifiers, cabinets, microphones and effects, with the promise of more to be added in future revisions. The initial version of Guitar Rig offered three tube amplifier emulations plus more than 20 effects including models of some well-known hardware pedals plus studio-style effects such as delay, reverb and EQ. The Cabinets and Mics part of the program has 14 speaker types, including the wonderful B4 Rotary Speaker taken from NI's very popular tonewheel organ plug-in. These are modelled as though they had been miked up using a choice of five microphone types, each with four different positions, and more flexiblity is offered by the ability to feed your virtual amps into up to eight miked speaker cabs at the same time. Apparently the modelling also takes into account the electrical reaction between the power amp and the speaker, though when multiple speaker cabinets are added, this is based on the first cabinet in the rack. The Split module allows parallel signal processing, where different amplifiers, cabinets and effects can be included in the two arms of the chain, which allows for the creation of very dramatic stereo effects and layers. In fact this is a concept that many sequencer designers would do well to include in their plug-in management sections. Further Splits can be dragged in to create multiple parallel signal paths and the output of each chain can be panned independently. Just before I completed this review, a pre-release software update was sent to me which added an AC30-inspired amp to the existing roster, as well as a treble booster and a psychedelic delay that can produce reverse delay effects as well as more conventional echo treatments. The package ships with a large number of presets in various styles so that you can experience instant gratification before going on to create your own custom patches, and be warned that the designers haven't imposed many limitations on what you can string together, so you have full freedom to create outrageous patches as well as sensible ones. You can also tweak the factory patches and save as many versions as you'd like. While most of the elements of Guitar Rig will be fairly familiar to anyone who has used either software or hardware amp modelling devices before, the tape decks deserve a little more explanation. Deck number one can play back audio files and time-stretch them or change their pitch without changing speed, whilst files or sections thereof can be looped and recordings can be made using the New button, though you can't use loop and record at the same time. It accepts any audio files in WAV, AIF, AIFF or MP3 formats, though for some reason it has problems handling 24-bit WAV files so these are currently limited to 16-bit. This is a known 'issue' and will be resolved in a forthcoming update. All recording is limited to 16-bit at the moment, but that doesn't seem to cause any quality issues. Tape deck two is more geared towards overdubbing so you can create riffs to play over, and because it comes at the end of the signal path, it records all the amp modelling and effects that you've applied in glorious stereo. The time and pitch features of deck one are missing but otherwise the idea is generally the same. Overdubbing is of the very simple 'sound on sound' type (using the phrase in its traditional lower-case meaning), which allows you to play something in deck one while playing along and then recording the results to deck two. There are no multiple tracks or means of changing anything after recording, but if you simply want to get musical ideas down and you don't have a sequencer, it's fine. 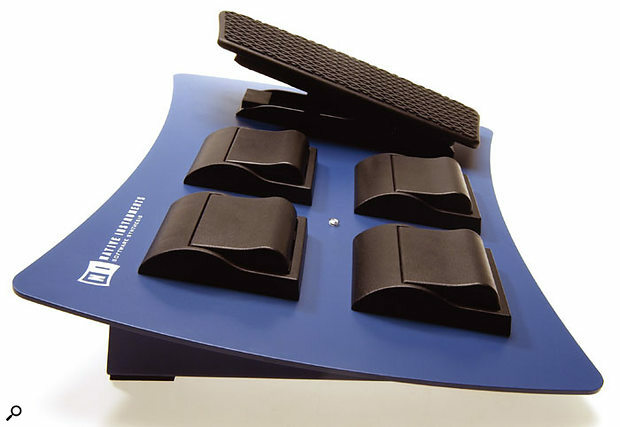 The hardware foot controller bundled with Guitar Rig is called Rig Kontrol and has four footswitches and a pedal. Unusually, it outputs its control signals not as MIDI, but in the form of a modulated audio tone that registers all the switch and pedal moves, which is recorded on the other half of a stereo sequencer track. The obvious advantage of this control system is that no MIDI interface is needed to use Guitar Rig. The only influence Rig Kontrol has over the guitar signal itself is that it provides a high-impedance, low-noise input and so saves the user having to find a suitable DI box, though having said that, I thought I got a better sound using Rig Kontrol than when I tried the software with a conventional active DI box. The guitar connects to the line input on the Rig Kontrol foot controller and the two line out jacks on Rig Kontrol connect to the line ins of your audio interface. Alternatively, there's also a two-channel mode where the two inputs can be used to process two different guitars, which could come in handy for jamming or recording with a colleague, though the Rig Kontrol pedal/switch functions don't work in dual-channel mode as both audio channels are taken up with guitar signals. Physically, Rig Kontrol is built into a tough metal case, and can operate from almost any AC or DC power adaptor that will physically fit into the socket. It can also run from batteries, and the current consumption is very low so they should last a reasonably length of time. As you'd expect, Rig Kontrol includes the necessary high-impedance input circuitry to match the output of a typical guitar fitted with passive pickups, and it is equally happy with active guitars and basses. The functions of the pedal depends on how you set up your patch: it is typically used to control volume or wah-wah, though it is also useful when assigned to operate the crossfader in the software's Split module (see box), allowing you to crossfade between two signal paths during performance. Patch and Bank switching is handled by the footswitches. There's no MIDI on the Rig Kontrol: instead, it puts out a stereo audio signal with your guitar on one channel and control data on the other. The Guitar Rig screen is divided into two main sections, with the virtual rack below the Kontrol Centre on the right of the window. Kontrol Centre takes the form of a toolbar to access key functions such as the tuner, metronome, patch naming, tape decks and so on, while the rack part is where you place your virtual modules to build presets. To the left of the window are three more sections that deal with bank and patch management, the palette of available rack components and global settings plus controller assignments, which are set up using simple multiple-choice menus. Because Guitar Rig offers a lot of modules and more are coming along, these are organised by type so that, for instance, when you want an amp emulation, you only get to see the amplifiers. Though most modules can be freely moved around in the rack, there are certain elements that always go in certain places, specifically the input section, the tape decks, the tuner and metronome and the output section. The amp, effect and speaker modules then slot in between these using simple drag-and-drop routines. Of course software wouldn't be software without a Preferences section and here you can choose from three window height settings (to suit your monitor) and also select a quality mode for the time-stretch option that can be used with tape deck number one. This allows you to work out exactly what was played during that amazing solo by slowing it down, and as this kind of processing also takes up CPU resources, you have the option to trade quality against computing power. Although the Rig Kontrol doesn't output MIDI, all parameters within Guitar Rig can be selected for MIDI control on a patch-by-patch basis. Rig Kontrol has no truck with MIDI, but Guitar Rig can and does. So, as well as controlling it via the physical controls on Rig Kontrol, you can also feed it MIDI from your sequencer, enabling you to automate more parameters. Normal plug-in parameter automation is also available to the extent that your host software supports it. Even keys on your computer keyboard can be used as real-time controllers, and to save reinventing the wheel, Controller Sets can be created and stored to be used again. In the Preferences section dealing with controllers, you let Guitar Rig know what controllers you have available and whether they are switched or continuously variable. You can then assign these to individual parameters within the preset you're working on. This is fairly flexible, but there are rules to help clarify the operation. If a controller is being used for patch or bank selection, then it can't also be used for parameter control, which seems sensible enough. A controller can only control one parameter within a preset, which is an obstacle to doing clever things like reducing chorus depth at the same time as you increase the rate, but this shortcoming is apparently due to a limitation in the way host programs deal with plug-ins and not a design oversight. Of course the same controller can control different parameters in different patches and there's also a Learn function that overrides any previous assignment made for the controller involved. As you'd expect, a patch is essentially a snapshot of all the control settings and module placements for the setup in question, but there's also a Template facility that allows you to save sub-components such as effect settings and EQ settings for incorporation into new patches at a later time. Furthermore, each module comes with its own presets list and each amp has a default mic and cabinet arrangement available. It is also easy to categorise patches according to musical style or other criteria if you feel the need, and if you are really intent on creating so many patches that its hard to keep track of them, there's also a database search facility where you can search by title word, style, author, instrument, 'before' date or bank. Favourites can be added to a category called, not surprisingly, Favourites. The rack always contains Input and Output components; the former has an inbuilt noise gate with adjustable threshold. The Output component has knobs for both master volume and the volume of the currently active preset. The Tuner and Metronome are also constant presences; the metronome syncs to tempo when plugged into a host sequencer that provides tempo information, and the tuner has an adjustable reference pitch as well as a mode for drop-tuning for the benefit of all those musicians hailing from Seattle. The tape decks make up the other permanently elected members of the rack but after that it's pretty much up to you. There's a choice of cabinets from 1 x 12 to 4 x 10 and 4 x 12, based on popular models from the major UK and US manufacturers, as a well as a less-than-authentic parameter that can be used to change the apparent size of the cab. Virtual mics can be virtually positioned in front of the virtual cab on-axis, off-axis, at the edge of the speaker cone, at a distance or even at the back of the open-backed cab models. There are five mic models from which to choose, including the ubiquitous '57', '421' and a couple of capacitor models, and there's also an Air control that adds synthesized early reflections to mimic what might occur in a real room. When two or more mics are being used together, the relative distance between them can be tweaked to change the phase-cancellation effects, there's a mic phase button and some basic treble EQ. Effects options include the new psychedelic delay, as well as more conventional modules such as a spring reverb.Though there are relatively few amp models at the moment, some come with a choice of preamp models, which can be thought of as amp channels, so for instance the Instant Gratifier solo head has Clean, Raw, Vintage and Modern variants. There are also two alternatives for the AC30 and Twin Reverb-inspired modules as well as the usual Drive, EQ and Presence controls. If you're into deeper-level tweaking, you can also press the Maximise button to see more controls, which allow you to adjust the imaginary bias of the imaginary tubes, mess with the power-supply capacitor values, drop or raise the supply voltage with a virtual Variac and even change the mains supply from 50Hz to 60Hz, all without the risk of electric shock! If you need searing shred that will sustain until your guitar rots, Instant Gratifier on the Modern setting is probably the one to go for, though it can turn its hand to clean sounds too. No prizes for guessing what Twang Reverb is based on either — and it has a tremolo plus authentic spring reverb. Once again, you can change the tube amp and power-supply parameters and, unlike on the original, you can adjust the reverb decay time and even the length of the virtual spring in the reverb model. Plexi is based on the obvious British classic with Normal and Bright channels, the usual controls and the now familiar amp and power supply adjustments. You can also mix the two inputs. The late arriving AC Box has all the familiar Vox AC30 controls, though it has been tweaked to let you mix the Normal and Bright channels, and two extra tone knobs have been grafted on. It also has a tremolo plus those under-the-hood controls for tinkering with the power supply and tube bias. Teamed with these amp models are two distortion devices, Skreamer and Distortion, plus separate stereo Tremolo, Stoned Phaser, Chorus/Flanger, Ensemble, Rotary Speaker, Oktaver, Filter (which handles wah-wah) and Talkwah. The latter is a voice-box filter effect that even has a variable mouth size parameter! Then there are a couple of variants on the EQ theme, a volume pedal, a limiter and another noise gate. Tube compressor emulation is available for clean sustain along with a four-tap delay/echo unit, a separate spring reverb unit and a studio reverb with variable room size and basic parameter adjustment. Interestingly, the Oktaver breaks up on anything but monophonic melody lines, just like real octave pedals. Delays can be sync'ed to tempo where needed, and unlike real gear where you have to observe such niceties as impedances and levels, you can connect almost anything to anything without worrying about cooked speakers or the smell of burning transformer! The update I installed also added a treble booster and the aforementioned psychedelic delay, plus Pitch Pedal for polyphonic pitch-shifting. A typical split setup. The Rig Kontrol's pedal can be used to crossfade between two elements in a split sound. Combing amp, speaker and effects to form a simple chain is as easy as you'd expect, but Guitar Rig also allows you to create stereo patches with different components in the left and right signal paths using the Split modules. Furthermore, although the vast majority of electric guitars have a mono output, many of the modules are stereo — not just the effects but also the speaker cabinets when using pan or the Air option that creates the ambience of a cabinet miked in a real room. If a stereo module is fed into a mono-only module, the output will be summed to mono, examples being mono amp models or speaker cabinets used without Air modelling. Splits are set up using the Split A and Split B modules plus the Split Mix module. Elements inserted between the two Split modules comprise one arm of the split while those inserted after Split B but before the Split Mix module comprise the other arm. Panning and A/B mix is independently adjustable for each channel using the Split Mix controls and there's also a Dual mode that keeps the two channels completely separate for when two guitars are being processed at the same time. The factory presets give a good account of what Guitar Rig is all about, but as ever, you really need to fine-tune them to your own taste and to match your own instrument before they really shine. Certainly creating your own custom stack isn't difficult, though with so many presets already on offer, it's often easier to modify something that already exists rather than start from scratch. The sound of guitar amplifiers, or models of guitar amplifiers, is very subjective, and every hardware and software modelling system I've tried to date has had its own character. Almost as important as the sound is the way the guitar feels when you play it, as there are some very complex things that happen between the ear, brain and fingers when you're playing. Most of this can be attributed to the touch-responsiveness of the amp emulations, and though I've yet to find anything that exactly replicates the experience of playing through a real amplifier, some models are extremely good. 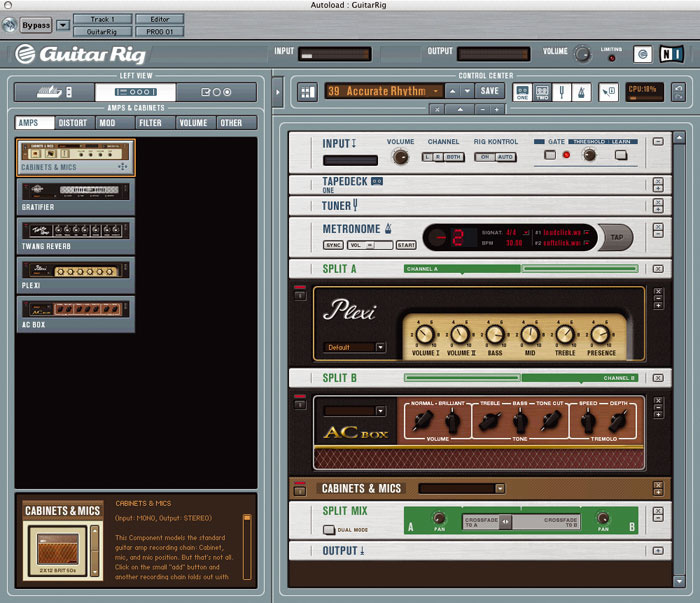 The physical feel of Guitar Rig when playing is comparable to the other better amp modelling software packages out there, and while it still doesn't match a real amplifier in this respect, the sounds are nicely touch-responsive and also respond well to backing off the guitar volume control. The amp sounds themselves are, quite literally, what you make them, because in addition to the usual controls, you have those extras for emulating a clapped-out or badly set up amp that could just provide the magic overdrive sound you were looking for. Likewise, being able to hook up a compressor before the amp allows patches to be created that are fairly clean but have lots of sustain. I liked the rack effects a lot, particularly the psychedelic delay, which produces as good a backwards guitar emulation as I have heard if set to 100 percent wet. However, what Guitar Rig is best at is excess. Forget all you've learned about gain structure, impedance matching or signal levels, because in Guitar Rig 's virtual world, you can feed 4 x 12 cabinets directly from compressors, you can daisy-chain different amps and you can have a floor full of virtual speakers and microphones. Some of the combinations yield quite unexpected results — don't be afraid to use one amp as the preamp for another, for instance. The user interface is a doddle to use, with thoughtful touches like Minimise buttons to squash the rack modules if your screen gets too busy. Conventional window buttons can be used to remove instruments from the rack, and when you drag in a new one, a red line appears between existing modules to show you where the newcomer is about to go. Simple amp sounds are simple to create and the spring reverb module is disturbingly authentic, but because of all the creative options available, you can go far beyond the norm to create sounds that are unique to you. Not all of these are pretty, but with just a little effort, you should be able to to get close to just about any guitar sound you've heard on record. Furthermore, no matter what amps and effects you use, the guitar signal is recorded clean and processed on playback, so you can change your mind about what to have in your guitar rack right up until the time you come to do the final mix. 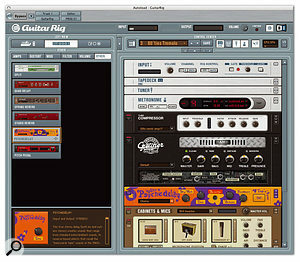 Guitar Rig isn't so much a new concept as a friendlier and more customisable version of what's gone before. While the playing experience may not be quite the same as with a real amplifier, the results you can get are excellent and make recording the electric guitar a pleasure. On the whole, Guitar Rig is very well thought-out and incredibly flexible. The floor controller is a nice touch for anyone who needs a volume/wah pedal or who is brave enough to use a virtual amplifier live, and its novel system of recording automation data certainly worked flawlessly. In addition to this, you can automate the parameters much as you would with any other plug-in when working within a sequencer. For me, though, the real beauty of the package is the straightforward drag-and-drop method used to create custom racks of amps and effects. Being able to ignore the laws of physics when interconnecting amps and effects comes a close second! The only law of physics you have to remain aware of is that of required CPU resources, and according to the CPU meters in Logic, a fairly busy Guitar Rig rack required around one-sixth of the power of a dual 2GHz Apple G5 computer. Unequalled ability to combine elements in unusual ways. May be too 'hungry' for some older computer CPUs. Guitar Rig might have a friendly interface but it is no creative lightweight. Whether you're into good basic guitar sounds or imaginative weirdness, it's a great tool.